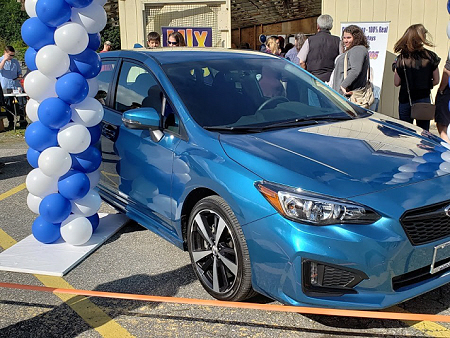 The FRONTIER MEDIA/JUNEAU cluster of Hot AC KSUP (MIX 106), News-Talk KJNO, Country KTKU (TAKU 105), Full Service AC KINY and Classic Hits KXXJ (107.9 KXJ) welcomed over 1,100 listeners to the conclusion of the three-month SUBARU FOR YOU promotion. The lucky winner, MARILYN MC DANIEL, drove off in a 2018 SUBARU IMPREZA SPORT HATCHBACK. “I am still amazed every time this group of stations conducts listener and customer-based promotional events,” Dir./Operations and Programming CHUCK GEIGER said. “They are like big parties with a thousand of our closest friends.” The stations are rolling right into the next event: A HAWAIIAN BEACH HOUSE FOR FOUR from ALASKA AIRLINES. Chuck Geiger thinking he’s at a heavy metal concert.